JUST SIX SESSION DAYS REMAIN IN LAME DUCK AND THE EDUCATION DOCKET REMAINS DEEP. Discussions continue around a range of major education issues – including a statewide educator evaluation system and revamped A-F school accountability. At this point, no action has been taken on these issues. As part of our mission to provide non-partisan data, analysis and expertise about Michigan education, The Education Trust-Midwest will continue to provide weekly updates on what’s happening on K-16 education through the “lame duck” legislative period, expected to run through December 18. STRONGER EDUCATOR SUPPORT AND EVALUATIONS STILL UNDER DISCUSSION. With support from nearly every major K-12 organization in Michigan, House Bills 5223 (O’Brien – R) & 5224 (Zemke – D) continue to undergo discussions after more than two years of deep work and consensus-building across sectors and organizations to build Michigan’s first statewide system of thoughtful feedback, support and accountability for educators. Governor Rick Snyder and the legislature has also committed millions in public investment to build the new system. In addition to passing the House of Representatives in May with nearly 90% support, the bills are supported by The Detroit News, the Michigan Education Association, The Education Trust-Midwest, the Michigan Association of Intermediate School Administrators, the Michigan Association of School Administrators, the Michigan Association of School Boards, the Michigan Association of Secondary School Principals, and StudentsFirst, among many others. Now the state Senate is reviewing the bills. We will continue to monitor this important work, which is essential to raising Michigan’s teaching quality and improving student learning. ROAD FUNDING PROPOSAL THREATENS SCHOOL FUNDING. On Thursday, the House passed HB 4539 (Schmidt – R). The bill would make changes to the fuel tax, eventually directing fuel tax revenue to roads. According to Mitch Bean, economist with Great Lakes Economic Consulting, the plan would eliminate a projected $800 million from the School Aid Fund by 2020. Money alone will not transform our state’s public schools. However, at a time when Michigan ranks near last for student performance in reading and math, our state needs to be investing more in proven strategies to dramatically improve our schools, not less. Our economy and our state’s future — and our students’ futures — count on it. “EARLY WARNING” SYSTEM PASSED THE FULL SENATE ON WEDNESDAY. Senate Bills 951-954 (Walker – R), SB 955 (Pappageorge – R) & SB 957 (Kahn – R) aim to identify schools that are at risk of financial distress earlier. The bills would permit the Department of Treasury to provide technical assistance and require additional reporting, among other things, in an effort to help districts before they post a deficit. These bills will be considered by the House Committee Financial Liability Reform on Thursday, December 11 at 8:30 a.m. MANDATORY GENOCIDE EDUCATION passed the full Senate on Thursday. These bills require that social studies curriculum for grades 8-12 include at least 6 hours of instruction about genocide each year. The Education Trust-Midwest joined other organizations last week that continue to call for Michigan to put into place overdue accountability for the authorization of charter public schools, regardless of school performance. These calls come on the heels of troubling new reports about Michigan’s charter sector. A new report from the pro-charter National Association of Charter School Authorizers (NACSA) ranked Michigan as last among five states with many charter school authorizers. 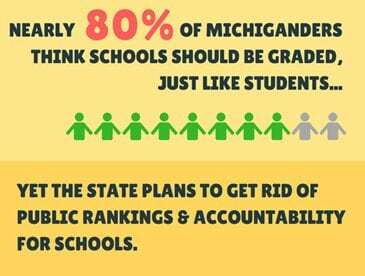 The group gave Michigan very low marks for the state’s failure to adopt best practices for charter authorizers, including sanctions for poor-performing charter authorizers. NACSA gave Michigan just three points – out of a possible 27 – in an evaluation of state policies governing charter school authorizer accountability. The impact of such authorizing is growing on Michigan students. Today Detroit, Flint and Grand Rapids have among the highest rates of charter school attendance in the country, according to a new report out released last week by the National Alliance for Public Charter Schools. 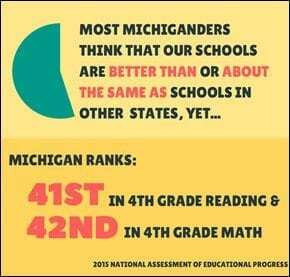 Ed Trust-Midwest supports high-quality charter schools and their growth in Michigan. Students of color and low-income students, in particular, desperately need more high-performing public schools in our state, regardless of who runs them. However, too many of the charter operators that are growing in Michigan are not providing truly high-performing school choices for our students. As the Detroit Free Press noted on Sunday, it’s time Michigan’s leaders got serious about making school quality a priority for all of our children. And while a new amendment to the A-F school accountability bill would prevent poor-performing charter schools from switching authorizers to avoid school closure, the truth is, the amendment would be a baby step toward real accountability for charter authorizing in our state. We support taking this first small step, though it would only be a beginning.